“A tale told by an idiot, full of sound and fury…signifying nothing” …Definitely NOT an apt description of Shakespeare’s shortest tragedy written circa 1605 at the time of King James I. Avarice, ambition, covetousness, and desire are intrinsic to all mankind except the saints! Macbeth; passionately portrayed by Owen Fawcett, returns victoriously from a battle. Three witches, inexplicitly unsupervised by Hecate, tells him that he’s about to be named thane (an ancient social class just below royalty) of Cawdor- a property he long craved; & even to wear the crown. His friend Banquo isn’t reallyon their list. At the urging of his wife, he kills Duncan 1st, leaves evidence on two dead grooms, and thus was named King. To self-preserve, other murders must occur and finally, a comeuppance to both Mac-the-Knife and his homicidal partner. Director David Matheson has taken liberties with the original especially in having the witches almost continually on stage and seemingly manipulating the play’s progress. Their ball of string symbolizing their attachment to each other also becomes a manifestation of their puppetry when it evolves into a web enmeshing Macbeth. All three (Alex Spyropoulos, Hannah Jack & Chiamaka Ugwu) incorporate choreographic movements that are almost serpentine in their sinewy acrobatics that help underscore their mischief as well as malevolence. The cast demonstrates the political power-plays, strife, battles and conflicts with much enthusiasm however it certainly tired me out. Arguing, debating, stomping and dashing give this rendering such a sense of vigorous energy that oftimes the lines being spoken seem to float just over one’s conceptual appreciation. Good thing my muse kept reciting the popular quotations that Shakespeare uses throughout the play! Hailey Gillis gives an authoritative reading in her Lady Macbeth portrayal. One can almost picture Hillary Clinton or Oprah in her depiction. The costumes are creative and evoke the style and mode of the period. The staging is not overdone but works. Lighting and sound are all strong contributors to the sombre mood of both plot and staging. 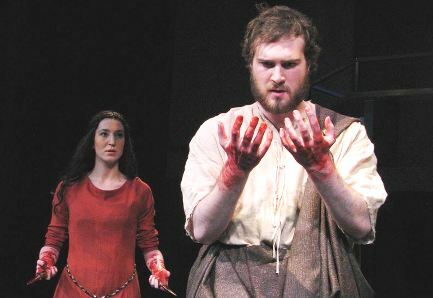 MACBETH will be at Theatre Erindale in the UTM campus until Mar. 24th.